There are those, like my friend the architect, who swear by the loafer or moccasin. I spent high school wearing a pair of cordovan penny loafers and such was their construction that I only had two pair in four years of daily wear. Alden makes the quintessential cordovan penny loafer (and a beautiful suede, too), Gucci, the horsebit loafer (as worn by Douglas Fairbanks, Jr.) and Belgian Slippers are unmatched for comfort, if not being among the sturdiest choices. 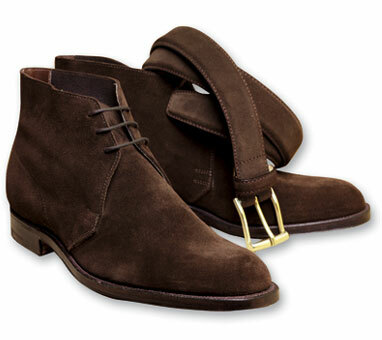 But I long to cover my size 9’s with a pair of Crockett and Jones’ Unlined Suede Chukkas (seen above from Ben Silver.) Elegant because of an elongated last and actual leather sole; casual by nature and easy to pair with all manner of sportcoat, denim jeans, blazers and tweed suits, the suede Chukka is the preferred shoe of Italian cognescenti. Chukkas are named for the “inning” at a polo match and were originally worn by polo players although they came into fashion during the 1950’s. They are really sort of a high shoe more than a boot and usually have one or two eyelets for laces. Here is the rule of thumb for wearing a heavier (not necessarily just in suede) shoe or ankle boot: your trousers should be of a heavier material. Linen or poplin trousers call for something else entirely. This entry was posted in Elegantology and tagged Elegantology, footwear. Bookmark the permalink. My sister used to live in Oklahoma and I bought my very first pair of chukka boots and remember good times wearing them! Chukka, Chuckle! I bought a pair of Feragamo Chukkas last year and I haven’t quite warmed up to them. I think the problem is my pants. I like my pants to fall just at the top of my shoe when I wear loafers, to show off a bit of sock or bare ankle. It seems when I wear the same pants with the Chukkas, the pants look much too short. Should I invest in a few pairs of longer pants to wear with the Chukkas or do the shorter pants work? I have a pair of tweed flat front trousers with a deep cuff that hit a little short when I wear my chukkas. I like the look, the boot is tall enough to pull it off. Mrs. PVE, why doesn’t it surprise me that you own a classic of (shoe) design? I always look forward to reading your comments.